2015 Archives - Touch Display Research, Inc. 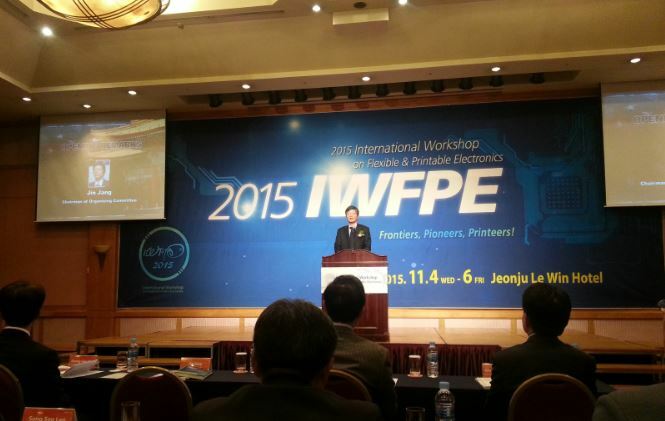 I just came back from the International Workshop on Flexible & Printable Electronics (IWFPE 2015), at Jeonju, South Korea. 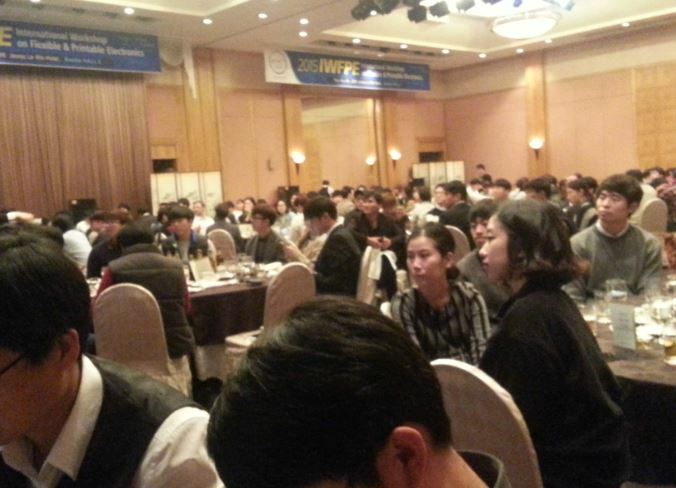 It’s a very successful conference with about 500 attendees. It’s my honor to meet some of you in person. 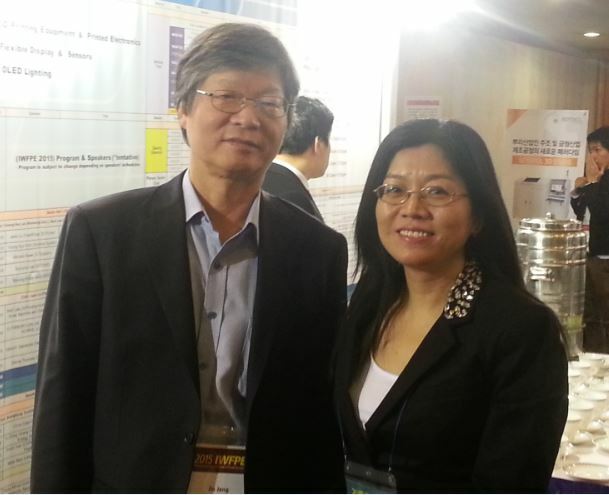 Samsung’s Dr. Sanyoon Lee gave a keynote presentation titled “The future prospect and challenges of printed electronics”. He discussed the outlook of printed electronics and ongoing projects supported by Korean government. On behalf of Touch Display Research, I gave a presentation on flexible display and flexible touch: technologies and market forecast. Photo by: Mr. Su at Evonik. This international workshop is also a very good networking opportunity with science professionals, experts and business partners from worldwide. More analysis and review of the 2015 IWFPE can be found in the “Touch and Emerging Display” November monthly report. This entry was posted in Displays, Flexible curved display, Flexible hybrid electronics, Flexible Lighting, Flexible OLED, Flexible touch screen and tagged 2015, Dr. Sanyoon Lee, Flexible, IWFPE, Printed electronics, Professor Jin Jang, Samsung on November 7, 2015 by jennycolegrove. I just came back from the trip of Touch Taiwan and IDMC (International Display Manufacturing Conference) 2015 conference. 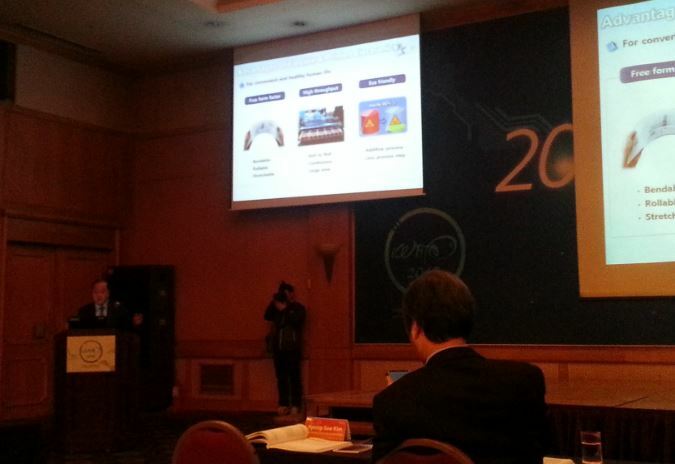 On August 27th, LG Display’s VP, Dr. SooYoung Yoon gave a keynote presentation about future display. He indicated, due to the sluggish global display market, technical differentiation for adding new values and finding new display markets should be essential for further growth of display market. Then he discussed OLED displays, especially flexible OLED is the direction to go. Photo by: Dr. Jennifer Colegrove, Touch Display Research Inc.
Dr. Yoon also discussed the technology challenges of flexible OLED display for high resolution, durability and automotive applications. 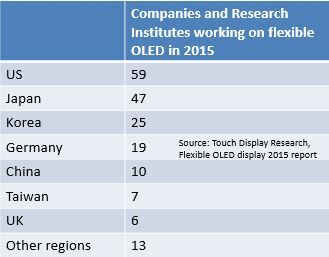 In the newly published “Flexible OLED Display Technologies and Market Forecast 2015 Report”, Touch Display Research analyzes flexible OLED display technologies, manufacturing process, other competing technologies, and profiles over 180 companies working on flexible OLED displays. More analysis of Touch Taiwan and IDMC 2015 are in the “Touch and Emerging Display” monthly report. 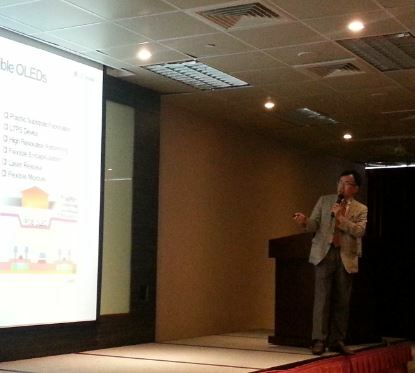 This entry was posted in AMOLED, Conference Review, Displays, OLED and tagged 2015, Dr. Yoon, flexible OLED, IDMC, LG, LG Display, OLED, Touch Taiwan on August 31, 2015 by jennycolegrove. I just came back from the SID Pacific Northwest (PNW) chapter seminar in April 2015 at Planar’s headquarter in Hillsboro, Oregon. There were about 30 attendees this time. It’s my honor to meet some of you in person. Photo by: Mr. Johnson, Tektronix, April 2015. 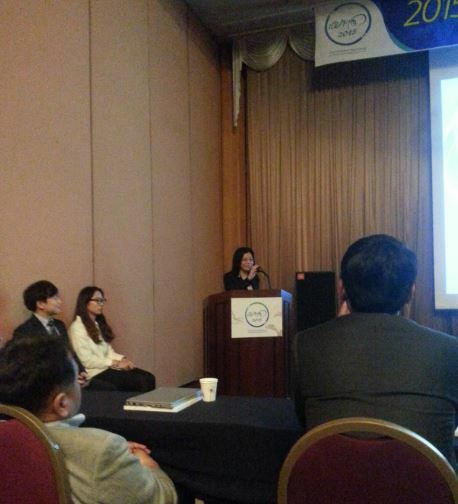 My presentation title was “How to survive and lead the Touch Panel and Touchless industry in 2015 and beyond”. Touch panel industry is quickly changing. Certain companies are profitable, certain companies are losing money. In this presentation, I discussed the opportunities for growth in the touch panel and touchless human-machine interaction industry. During this trip, I also had a chance to visit Planar and discussed touch display topics with others. More reviews can be found in the Touch and Emerging Display monthly report, April issue. 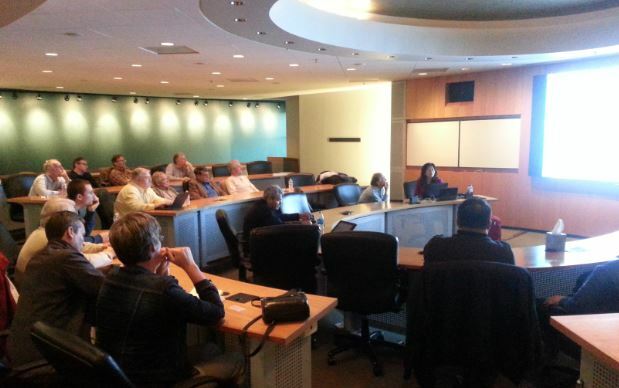 This entry was posted in Displays, Gesture control, Touch screens, touchless control and tagged 2015, Pacific Northwest, seminar, SID, touch, touchless on April 10, 2015 by jennycolegrove.